I finally got around to reading the novel after being adviced by a friend, and chancing upon the book in a thrift store. Although I was initially unimpressed, as Oceania started to come across more and more as a depiction of a communist state, and not any powerful state, as I had anticipated. The description of the mechanics of a dystopian world order and an all powerful state through “the book” also seemed rambling and lacking in unity. But as I read on, the novel pulled me deeper and deeper, and I finished the latter part in a single sitting. The latter part seems to me to have been delivered in an epiphanic state of mind. I loved the fact that the final justification of an all powerful state was not a misplaced pursuit for utopia, but a raw lust for power – pure and simple. What was especially poignant to me was that deep inside him the protagonist was able to retain inner diginity in the face of the most horrible torture, and a belief in his truth even with the entire world pitted against him. But once he betrayed himself to himself, a belief his own basic diginity and inner worth as a human was forever gone. The final betrayal was not imposed from outside, but came from his own self – and then all was lost. You are forced to raise that question for yourself – in that moment of supreme anguish, would you betray that which inside yourself you hold dearest? By the end of the novel, I can say it is one of the best books i’ve ever read. It is incredible that the same act of writing, which produces the most superflous products like an article on “5 ways to promote your blog traffic” can also produce something which can question human life in the deepest way. the devil pays tribute to my badness!! Having long been interested in the politics of the middle east, I just finished reading a history of the middle east. With a new conquest or dynasty every sentence it was nearly impossible to keep up and retain much of what I read. It did however help me form a more accurate, although impressionistic view of that part of the world. One impression I left with was the futility of of revolution, and the difficulty of introducing real change in a society. The middle east’s story seems to be a long series of revolutions and counter revolutions – socialist, religious, pan-arabic, but they seem to all end up as tyrannies. Oliver Stone’s “Savages” is a love story. A story of Chon’s love for O (the rather abruptly named lead lady). And O’s love for Ben. And Ben’s love for Chon. Those of us not introduced to the joys of the movie yet, will immediately recognize it as a love triangle, especially those raised on Bollywood fare (like me). Chon’s beloved O likely fell for Ben, Chon’s best friend, while Chon was out serving in Iraq – we speculate. Or Chon secretly loved O, but stepped back when he saw the flowering of the love of O and Ben, his brother. 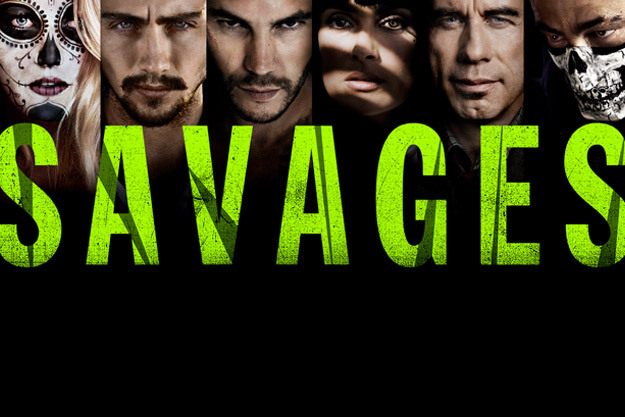 Savages is not your usual love triangle. Love in Savages is triangular, and simultaneous. Chon loves O loves Ben – all at the same time. It is about a redefinition of traditional relationships. Those of us used to the symmetry of 2 in a relationship will certainly protest. 3 way relationship? There must certainly be catfights, and punchups, and jealousy, and drama! Wrong again. It is a happy relationship of 3. Some of us would still try to reduce it to its physical aspects. That again would be false, because this relationship involves emotion, companionship, and a willingness to make the supreme sacrifice – the usual charter of relationships. There is drama, but in the backdrop. A plot of gangs, drugs and kidnapping forms the backdrop against which this relationship of 3 plays out. But to me the interesting part was the very idea. Oliver Stone is certainly no shrinking violet when it comes to taking on bold themes. Natural Born Killers is one prime example. The movie is perhaps a reflection of society, where relationships are morphing. Such liaisons are still likely quite at the periphery, but Oliver Stone is not one shy of provoking. For the life of me, I couldn’t find where I had read the following concept of Jung, though i am relatively certain it is Jung authored. The concepts are that of “expansion of personality” and “contraction of personality”. It sheds some light on the oft used cliche of “be yourself”. When we think of “the real me”, we prefer to see ourselves in the situations in which we thrive, while it is equally true that we are still our own person when in situations we recoil from. When our personality is “expanded” we assimilate contents of our environments into “me”. Everything that happens around us is a part of “me”, and reinforces our sense of “me”. On the other hand, when our personality is contracted, we tend to define ourselves in exclusion. Things in the environment threatens our sense of “me”, and we define ourselves in negative terms as a contrast. When you have a self esteem problem, the latter seems to be a strong force.